Everything you hear and read online basically says: “You cannot go to Egypt alone and you should always have a man with you.” I tend to disagree with this statement as the reality was way different for me. Please note that this post is based on my experience based on my two trips to Egypt (first as an 18-year old, second as a 29-year old). I completely understand if some other women might feel differently. What Kind of Solo Travelers Go to Egypt? I think before answering the question about whether it’s safe to travel to Egypt alone, you need to understand what type of people go to Egypt independently. Why? Simply because as you can imagine the expectations might be different for a trip to Egypt where you’ll be wandering through ancient world treasures and learning about its history, or Iran where you cannot drink, and a backpacking trip to Koh Rong in Thailand. Every other independent traveler I met in Egypt was mature, interested in actually embracing the experience and diving into an adventure out of their comfort zones, instead of looking for the next McDonalds and other things from the Western world. I met and saw many travelers who were genuinely interested in ancient history and listened to their guides, and weren’t just interested in taking their next Instagram shot before quickly moving on. I guess if you’re not into old architecture you might get bored after day two. But trust me, seeing so well-preserved ancient graffiti and huge pillars is such a unique experience that can blow me away every time I visit Egypt. I had the nicest experience in Egypt and while some might say that women get harassed, I didn’t feel that way at all. Let’s make something very clear here: Egyptian men are surely flirtatious. They’ll tell you that you’re beautiful and that you’re the queen of Egypt. Smile and carry on walking as they’re quite harmless. Ninety percent of the time that’s all they want from you. Egyptians are seriously one of the nicest and most hospitable people on the planet. Random strangers were always happy to help me. Sure, some wanted to get some money, but for every person that wanted some money from me, I met 5 that selflessly wanted to make sure I was ok.
I’ll give you one example, but I have many more. When I went to the Egyptian Museum in Cairo I arrived during their break and had to wait almost an hour outside, in the heat and sun. A man who was passing by overheard my conversation with guards and after a quick chat he offered to walk me to a nice local market. Obviously, I was skeptical at first. Does he want some money? Does he want to kidnap me? The man quickly realized what could I be thinking and assured me that he doesn’t want any money and he’s actually in a hurry to pray, but I’m in his country and he wants to be helpful, so if he’s ever in my country someone else will help him too. People really believe in karma in Egypt. He helped me walk across the street (which at this square was a scary thing to do), introduced me to a market guy and politely said goodbye and good luck. The market guy immediately offered me a tea and before I could even think that now I’m going to be forced to buy something from him, he said that I definitely don’t have to shop here. We talked for a bit and in the end, he walked me back to the museum. I guess it’s nice to say yes and accept the kindness of strangers on your travels. 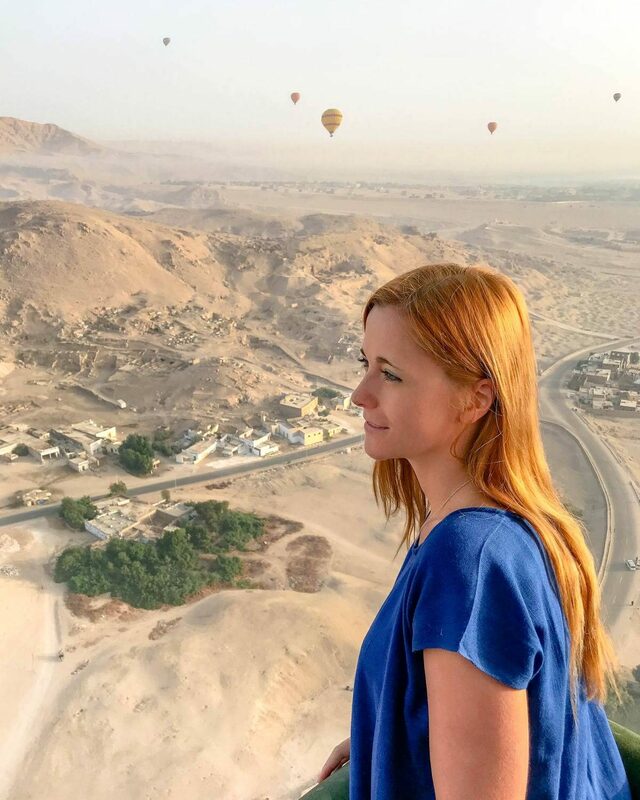 What to Wear in Egypt as a Female Traveler? Do you need to wear hijab in Egypt? Nope. Will it help you with the vendors? Nope. Will it help you blend in? Not really, you’ll be easily spotted as a tourist anyway. You might be surprised by what I’m going to say, but after my trips, I’m not entirely sure about having to cover up head to toes at all times. I packed long skirts and long-sleeved blouses and every time I put it on, locals I made friends with made fun of me asking if I want to be Egyptian. I was dying of heat at the pyramids and the guide simply told me to feel at home and remove my cover up if I feel like it. He assured me that he doesn’t feel offended and everyone around me is a tourist anyway. When I looked at how other tourists were dressed, there wasn’t any pattern. Some women were fully covered up including their heads, others were wearing baggy pants and loose shirts, but there were a lot of women in shorts and regular t-shirts. That said, use your common sense. Don’t wear bandage dresses, or transparent shirts – be comfortable but modest. When I travel to Middle Eastern countries I usually avoid wearing branded clothes that scream ‘USA’. In my experience, you’ll be harassed more by vendors if they see you’re wearing a fancy outfit from Revolve or something that screams branded and expensive. I usually buy some local outfits wherever I go (locals loved me wearing Moroccan dresses in Morocco), but this time every local kept telling me that buying a long dress like local women wear would make me look like a weirdo. I ended up buying a shorter one. What will help you, however, are sunglasses. Sunglasses are a must, not only because it’s bright and sunny out but also because they make it easier to avoid making eye contact with men on the street. If you find yourself without shades, don’t look men in the eye. It’s considered a form of flirtation. Bring a jacket as nights are colder, so you will be freezing without it. If you’re planning on entering a mosque, be prepared to remove your shoes at the entrance. Make sure your shoulders and upper arms are covered with a scarf or long sleeves. Some mosques, like Al-Azhar, actually provide covers for women, but it’s better to be prepared. 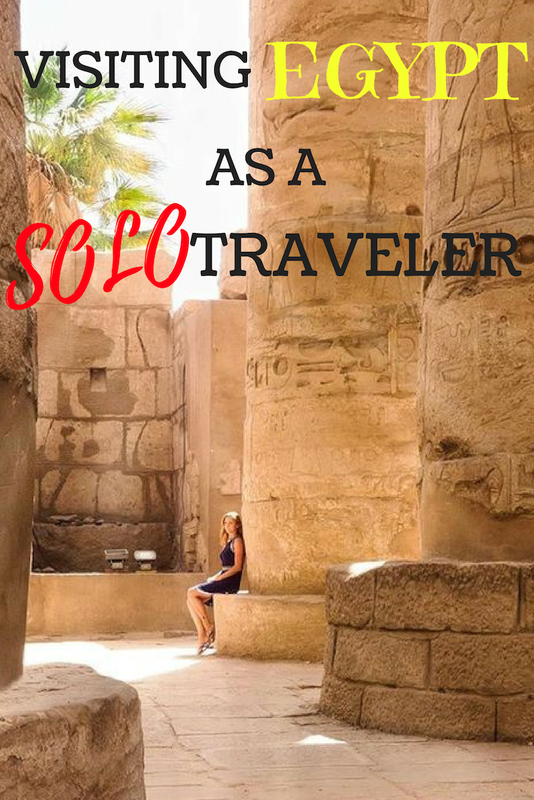 Any questions or comments about Egypt or solo travels? Shot them below! I don’t disagree with you there though I’d like to also point out my own experience when I went to Cairo with my boyfriend 2 years ago. Though the men did not harass me (possibly because I was with my boyfriend), I did feel a little uncomfortable with the stares/looks they gave me as I walked along the streets in Cairo. Not being dramatic or sensitive, but my boyfriend did not get the same stares. That being said, I ignored them and just walked on so I guess you just have to be aware that as a female, you’re likely to get stares (of course that was just my experience and may not be 100% true to all females). We did have different experiences in Cairo city center and Giza – where you really have to be extremely careful when people try to “help” you in Giza because they will scam you of Help money (absolutely happened to us ALL THE TIME in Giza) so we learnt to say NO to every help. However in Cairo, the locals tend to be more pure and genuine – a local guy helped us get on the right train, and also gave us tips to travel in public transport without asking for anything in return. Or you could wear some rings (engagement or wedding rings, even fake ones) just to discourage people to take interest in dating you. Or doesn’t that trick work in Egypt? I guess you can do that in any country. In my experience most Egyptians are respectful and if you say no, they won’t try to date you. In fact, the majority of men I spoke to wouldn’t make the first move on foreigners. Very interesting about the “dress code”. I always assumed I’d need to cover up in Egypt.